Help your child with letter reversals! Get your FREE 13-page e-book! Does your child sometimes confuse certain letters, like b and d or n and u? Beginning readers and dyslexic children may struggle to differentiate between letters that have similar shapes, and issues with letter reversals can have a direct impact on reading, writing, and spelling. But your child doesn’t have to struggle—letter reversals CAN be solved! 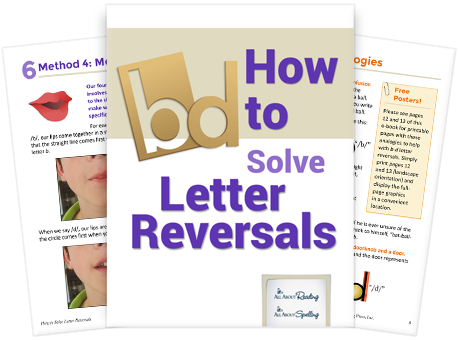 Download this free e-book to explore 4 methods that effectively solve letter reversal problems and help stop the confusion. Three analogies to help children distinguish between b and d—for good! If you have any questions as you read this e-book, please let us know! You can email us at support@allaboutlearningpress.com, or call us at 715-477-1976. No question is too big or too small—we’re here to help! 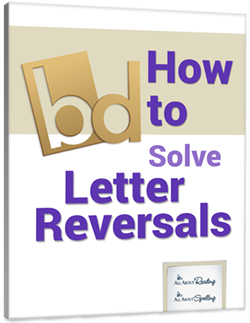 Letter reversals CAN be solved and this e-book will show you how.